Teachers from Limestone participate in various activities to get students moving – and thinking. Teachers across Limestone are learning how to incorporate physical literacy into their practice and programs through the delivery of enriched activities in a variety of settings. 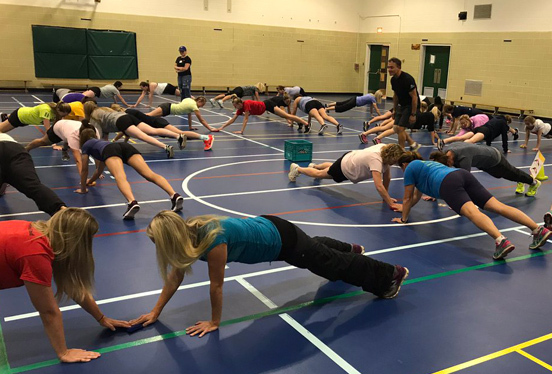 Organized by Kingston Gets Active, the half-day Physical Literacy Workshop demonstrates how teachers can help develop more active and engaged students by linking physical activity and learning. The term physical literacy is a new term to most people but it is gaining momentum in education, recreation, and sport as evidence continues to grow that children needs to be physically literate, and acquire certain skills to engage in lifelong physical activity. Just as children need to learn reading, writing and mathematics to succeed in life, they must also learn how to move and be confident in their bodies. Regular physical activity is connected to better health, positive self-image, better school grades and improved social well-being in general. Students from Limestone’s North Addington Education Centre’s Student Leadership Program will also attend to learn how they can encourage and engage their younger peers in physical literacy and activity at their school.